For her first time exhibiting in Asia, FSU Art MFA ’06 Helene Mukhtar is bringing a series of paintings she completed specifically for the show. Abstracted urban architecture and seascapes with turbulent waters provide the backdrops for her cast of characters. 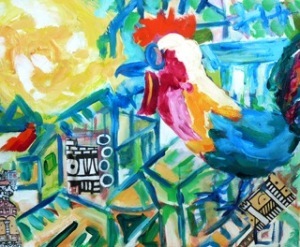 These scenes are painted with her usual bold expressionist style, striking colors and humor. This work also highlights her deep emotional connections with the world around her. As she was preparing for the show, demonstrations were taking place in Hong Kong and these events resonate in her work. “Woman in Chains”, “Bird in Chains” and “Good Morning Sunshine” are part of the series she presents at the show. The 6th edition of the Asian Contemporary Art Show welcomes exhibitors from five continents – from Hong Kong, China and most parts of Asia, to Australia, North and South America and Europe. Along with Helene Mukhtar, 6 other artists are coming from New York to represent the United States: Bob Clyatt, Julio Valdez, Leah Poller, Miquel Salom, Roseline Koener and Shira Toren. 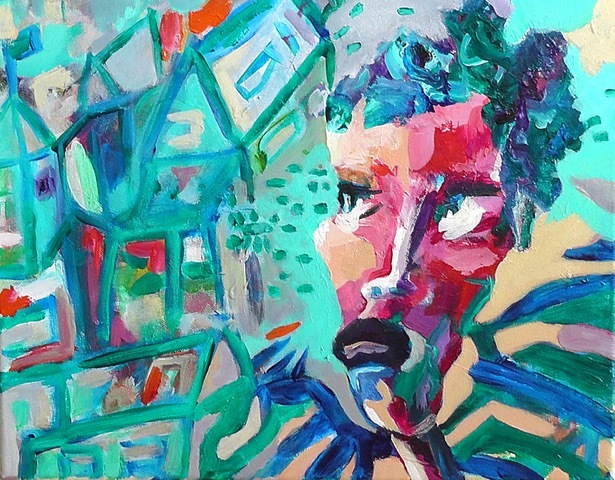 Helene Mukhtar will show her work with ATM Creatives, a New York, Soho-based Artists’ Collective, in room 4422.